Cheap hot tub spas may either mean a low priced or low quality product. With the global recession lingering, searchers for cheap hot tubs just want a low cost spa without burning through thousands of unnecessary dollars, sometimes to fund a glitzy retail showroom of certain retailers. This article will explore several options on saving thousands and getting a discount or cheap hot tub. The cheapest hot tub may be one that you make yourself out of a hot tub building kit. 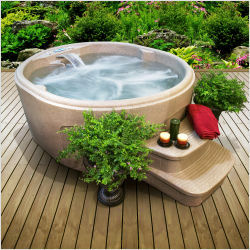 Similar to the old wooden hot tubs of the ’70s, hot tubs can still be constructed by the handyperson. Sourcing hot tub parts online has never been easier, so the actual shell or structure is the most challenging part to build. The next cheapest hot tub would be those found in the inflatable spa category. These spas use a low cost vinyl or other material that blows up into the shape of a round mini-pool or spa. Often these types of hot tubs do not come with their own heater, but rely on the heat from a pump to warm the water. While this may be an acceptable solution in warmer climates, the Northern climates may find that the water does not maintain temperature very well or for very long while in use. The acrylic hot tub is also referred to as a portable spa, because it theoretically can be moved and is self-contained, just requiring power and water filled from the top with a garden hose. Unlike the true portability of the blow-up or inflatable type hot tub, the acrylic portable spas do usually require at least 2 people to move along with dollies or other assistance. On the other hand, the acrylic shell is more robust, cannot be punctured and these type of spas also usually come with a heater (although there are some that use acrylic but still warm the water by the pump instead of a dedicated heater). Getting a good deal on an acylic, hard-shell spa can be a simple as locating a factory that has been in business for a long time and also sells direct to consumer, either through a local factory showroom or through their online store. Cutting out as many middle-men as possible allows the consumer to save money. Often times the factory support is superior to dealer service who may not completely understand the inner workings of the products they are selling, especially those dealers that represent more than one product or spa line. There are also “cheap” spas on the market, as in cheaply made. Imported spas from China have had mixed reviews as both electronics and materials may not be up to local standards. Getting manufacturer support from China is all but impractical and usually is coupled with a time and language barrier. If in North America, it is best to source a spa in North America where the manufacturer is directly accountable for their product. Rely on a hot tub manufacturer with at least 10 years experience and preferrable over 20 years as they have experienced many different economic environments and also have continuously been working on improving the product through customer feedback. Buy a cheap hot tub spa without buying a “cheap” hot tub. One source of factory direct hot tubs by a manufacturer’s distributor that has been in business for over decades is http://www.hottuboutpost.com.